The best guarantee of exam success is to know the material and be prepared for the questions you're likely to encounter. 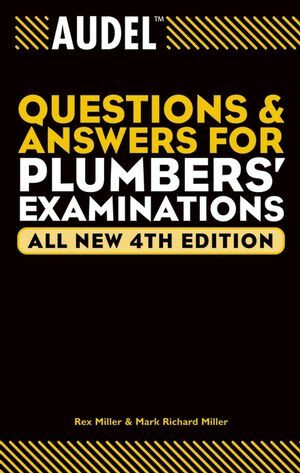 This book provides hundreds of questions and answers to help you review, tips for more productive studying, advice on how to approach the exam, a valuable chapter that outlines state licensing requirements for apprentice, journeyman, master, and inspector, and more-all designed to help you face the license exam with confidence. Rex Miller was a Professor of Industrial Technology at The State University of New York, College at Buffalo for more than 35 years. He has taught on the technical school, high school, and college level for more than 40 years. He is the author or coauthor of more than 100 textbooks ranging from electronics through carpentry and sheet metal work. He has contributed more than 50 magazine articles over the years to technical publications. He is also the author of seven Civil War regimental histories. Mark Richard Miller finished his B.S. degree in New York and moved on to Ball State University, where he obtained his master’s and went to work in San Antonio. He taught in high school and went to graduate school in College Station, Texas, finishing the doctorate. He took a position at Texas A&M University in Kingsville, Texas, where he now teaches in the Industrial Technology Department as a Professor and Department Chairman. He has coauthored seven books and contributed many articles to technical magazines. His hobbies include refinishing a 1970 Plymouth Super Bird and a 1971 Roadrunner. Jules A. Oravetz was a professional engineer and the author of numerous books for the plumbing and pipefitting trades, as well as those for building, grounds, and garden maintenance. Chapter 1: Basic Plumbing Installation Principles. Chapter 2: Plumbing Drawings, Material Takeoff Procedures, and Typical Plumbing System Layout. Chapter 4: Materials and Fittings. Chapter 5: Joints and Connections. Chapter 6: Traps, Cleanouts, and Backwater Valves. Chapter 7: New Flush Valves, Showers, and Faucets. Chapter 9: Interceptors and Special and Indirect Plumbing Wastes. Chapter 10: Drainage, Vents, and Vent Piping. Chapter 11: Water Supply and Distribution. Chapter 12: Private Sewage Treatment Facilities and Residential Trailer Plumbing Standards. Chapter 13: Plastic Pipe and Fittings. Chapter 14: Plumbing Installation Inspection Tests. Chapter 15: Steam and Hot-Water Heating. Chapter 16: License Requirements and Applications. Appendix B: Professional and Trade Associations.